I recently attended a Continuing Legal Education (CLE) course on the topic of parenting plans for young children. We had a family law Judge come over from Portland as well as some mental health specialists speak at the class. They presented great information, some was new and different while they went into great details in other areas we’ve discussed previously. Some of these areas included what defines a young child, domestic violence’s impact in a home, how unique each family in divorce actually is and how to advise the parents of young children going through separation or divorce. The course began by specifying that young children are considered to be “Birth through Three”. That is, children up to 4 years of age. The speakers made it a point to state that you have to look at a child’s “developmental” age as well. You might have a 5 year old that is functioning at a 3 year old level, in which case a parenting plan including too many overnights may not be appropriate. Many of the presenters also focused on how each family is unique. This is something I have found in my non hostile family law practice repeatedly. Young children “attach” to one parent normally. Attachment is a deep and abiding emotional relationship between the child and their caregiver. This attachment allows young child to emotional regulate with a secure person. The next type of connection is called “bonding”. Many parents bond with their children. Here the caregiver sets the pace for interaction with the child. The attachment relationship is deeper and babies and young children require both kinds of relationships in their lives. I did learn that it can be harmful to some infants and young children if they are away from their “attached” parent for too long. We also learned about the impact of domestic violence. It is harmful and traumatic for children to be present in any situation where domestic violence is occurring even if they aren’t the victim. Domestic violence in childhood is directly correlated with difficulties in learning, lower IQ scores, deficiencies in visual-motor skills and problems with attention and memory. The bottom line is that even though for example Mom says, “Dad hurts me but he is great with the kids” this statement is probably not true. Studies have shown that young children are traumatized by any kind of violence especially against their primary caretaker. It is important in family law to look at each specific case. We were encouraged to look at safety factors first and then the trust and security with each parent. Each family going through a divorce is unique and as family law attorney’s we can’t lose sight of that! We need to examine each parent’s mental health, where the child is developmentally and other family factors when determining overnights with young children. Sometimes, parents are separated by a long geographic distance and the parenting time recommendation was for the nonresidential parent to come to the young child’s world. This creates the least disturbance. Obviously, as the child grows and has healthy development, then there will be more overnights available. The long distant parent can chat by video and stay in contact as much as they can so the young child knows them. Creating or developing parenting plans is not easy and parents must realize that the children’s needs must come first. The needs and wishes of the parents come second. I don’t think any parent would want to cause harm to their child. It is important to understand where your child is developmentally and craft a plan accordingly. Sometimes the Deschutes Standard Parenting Plan isn’t able to fully accommodate unique family circumstances or children’s needs. 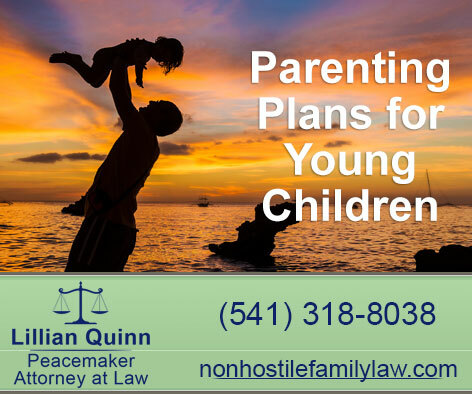 A child therapist can be helpful and an experienced family law attorney may be able to help you craft a more suitable plan as well. Overall, I thoroughly enjoyed this discussion and education and look forward to it furthering my ability to better advise families in Central Oregon as they work through their divorce and parenting time decisions.